Of all the things Anya expected to find at the bottom of an old well, a new friend was not one of them. Especially not a new friend who’s been dead for a century. Falling down a well is bad enough, but Anya’s normal life might actually be worse. She’s embarrassed by her family, self-conscious about her body, and she’s pretty much given up on fitting in at school. A new friend—even a ghost—is just what she needs. Meet Anya. She's your typical Russian immigrant, high schooler who doesn't quite fit. She's done her best to lose her accent and wear the right clothes, but making friends is difficult. Until she meets Emily...in a hole in the ground...a rather unconventional way to meet a friend, but Emily is a rather unconventional friend. She's a ghost. 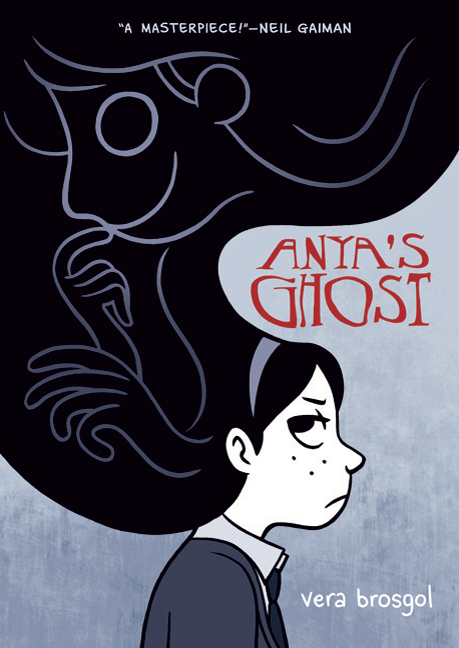 Anya's Ghost was a breath of fresh air from the manga I've been reading each week (not that I don't completely enjoy reading manga, but...seeing as how I never fully understand what I'm actually reading, it was nice to immediately "get" a story.) The story is equal parts funny and creepy, and the artwork is spectacular. I did think that Emily looked a lot like the podlings from Jim Henson's The Dark Crystal which was a bit distracting, but her vacant eyes made for super creepy thrill. The book, storyline, and artwork were different and intriguing. I definitely recommend this non-superhero graphic novel. Go ahead...try something new.